An interdisciplinary approach with a commitment to innovation and mainstreaming of human rights in disaster risk management and development. Cross sector network of stakeholders [including researchers, community, NGOs, business, policy makers and donors]. Strategies for ensuring the rights of vulnerable groups in disasters and development might better be realised. 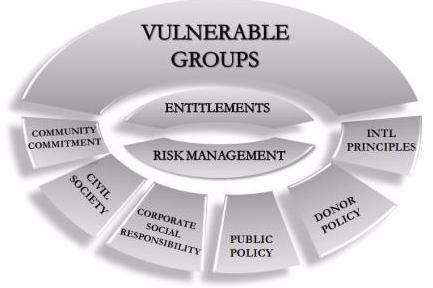 Vulnerable groups in disaster management and development cycles in the Pacific region. Is anyone listening? European Union human rights in external action. Externally funded by the New Zealand European Union Centres Network, 2011- 2012. Partnerships across the Asia Pacific: assessing the impact of EU external action in protecting and promoting children’s rights. Externally funded by the New Zealand European Union Centres Network, 2010-2011. Lesser Voices, Vital Need: European Union Humanitarian Action in the Asia Pacific and the Protection of Children. Externally funded by the New Zealand European Union Centres Network, 2009-2010. Annick Masselot, Associate Professor, Department of Accounting and Information Systems, University of Canterbury, Christchurch, New Zealand. Sarah Christie, PhD Candidate, University of Otago, Dunedin, New Zealand.